The Lantern is published three times a year. A one-year subscription includes three (hard) copies that are mailed out to you. Individual accounts allow for personal reading use only. Institutional accounts allow libraries to keep a copy of the journal and make them available for appropriate photocopying of articles. Online payments are via secure credit card. All credit card information handled by SecurePay is done so within the SecurePay Data Base Vault, protected behind two forms of encryption methodologies and independently audited under PCI DSS. Subscription is also possible by mail with payment by cheque in Australian Dollars or by Direct Bank deposit (Australia only). Please check our main page for details. If any item you purchase from this site has been damaged please return it to us in original condition within 30 days of receipt and we will replace the damaged item or fully refund if the item is unavailable. We will issue a full refund for any over-payments. The listed subscription prices include postage. Please allow two to three weeks for the delivery of your hard-copy journal or back order issues. We aim to ship within three business days (unless there is a problem with payment processing). We welcome submissions of articles and case studies on acupuncture, Chinese herbal medicine, qigong, tuina, herb cultivation or other modalities that would be useful to students and practitioners of Chinese medicine. We reserve the right to edit submitted articles. We may contact you with queries or comments, or in the event of major editing. 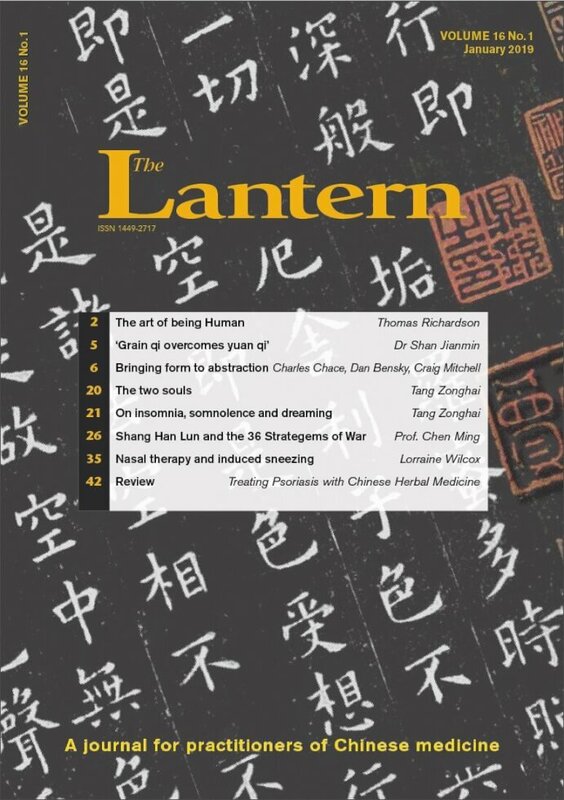 Upon acceptance of a submission the copyright of the material is transferred to us, solely for the purpose of publishing it in The Lantern Journal of Traditional Chinese Medicine and possibly in part or whole on our associated website. We reserve the right to edit or refuse submitted articles and to publish reprints and compilations of any articles that we originally published. Please provide articles as an e-mail attachment in MS Word. Articles should include endnotes and reference section. Please follow APA style. References should be given wherever possible for quotations and specific information referred to in the text. References: For books – Author. (Year). Title. City, Publisher. eg: Maciocia, G. (1994). The Practice of Chinese Medicine. London: Churchill Livingstone. For book sections/chapters: Author (Year). Title. In (Ed. ), Book Title (pages). City: Publisher. Eg: Sivin, N. (1991). Traditional Medicine in Contemporary China. In D. Bensky & R. Barolet (Eds.) Formulas and Strategies. Seattle: Eastland Press. For journals: Author. (Year). Title. Journal, Vol., pages. Eg: Clavey, S. (2003). Notes on the treatment of male infertility. JCM 73, pp.45-52. Chinese terms should be referred to in Pinyin format (italics) and common English translation (in brackets), e.g. Lei Jing (The Classic Classified). Herb names in the text should be in Pinyin (italics) with Latin names given in brackets: e.g. Dang Shen (Codonopsis Radix). When listed in a herbal formula, the dosage should follow the pin yin name: e.g. Dang Shen 15g Codonopsis Radix. Names of organs should begin with capitals. All other TCM terms, such as yin, yang, wind etc. should not be capitalised: e.g. Liver blood, Lung qi, wind-heat. Herbal prescriptions should show the Pinyin name (italics), followed by the common English name, e.g. Liu Wei Di Huang Wan (Six Flavour Rehmannia Pill). For both herb and formula names the Materia Medica 3rd Ed. (Bensky, Clavey & Stoeger) and Formulas & Strategies (Bensky & Barolet) – both from Eastland Press – should be used as a guideline. Acupuncture points should be referred to using Pinyin name and point number, using A Manual of Acupuncture (Deadman et al) as reference, e.g. Lieque (LU-7), Zusanli (ST-36), Diji (SP-8). Graphics can be supplied in the form of JPEGs, high-resolution PDFs, TIFF or EPS files. JPEGs and PDFs are easier for emailing, as most ISPs observe size limits. If graphics contain text (eg. Chinese characters) the fonts need to be embedded in the graphic.